Nearly 1 in 3 Adults has hypertension and it’s on the rise. 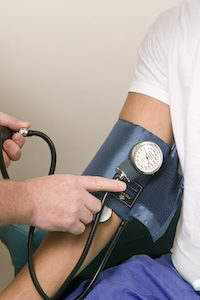 A recent article by AP reports US fails to fight High Blood Pressure. High Blood Pressure is relatively simple to prevent and treat yet it’s the nation’s second leading cause of death, simply cutting salt, eating more potassium and getting some exercise. It had long been supposed that the effort involved with weight training could be problematic for people suffering from high blood pressure. However, the medical literature reveals that properly performed strength training has actually been shown to reduce resting blood pressure in mildly hypertensive adults without the risk of dangerous blood pressure increase. Check us out at Vertex Fitness and see how we can put you through a safe and effective workout. And meet your fitness goals! There’s No Quick FixHappy New Year!